A “diagram” is known to be a symbolic representation of some information which has to be visualized with a use of some particular visualization technique. Diagrams have been known since ancient times, but they became more prevalent during the so-called “Enlightenment”, which was an intellectual and philosophical movement dominated the world of ideas in Europe during the 18th century which was also known as “The Century of Philosophy”. One of the techniques can be a 3-D visualization which is the one that can be projected onto a 2-D surface. Sometimes people use the word “graph” instead of the word “diagram”. The term “diagram” itself can have a general or specific meaning, which can be a “specific kind of visual display” or simply “visual information device”. In science, this term is used in both ways. In the specific diagrams as well as charts there is a contrast with “computer graphics”, as well as “infographics”, “technical illustrations”, maps and technical drawings. Diagrams are usually used for illustrating the abstract rather than literal representations of some information. The essence of a diagram can be seen as a form of visual formatting devices, a display that does not show numerical data, but rather the relationships as well as the abstract information. “Diagrams” can be also defined as the simplified figures, which are often based on a set of rules. There are very many types of diagrams, which you can draw using ConceptDraw DIAGRAM software, including the so-called “chart-like” diagrams (describe a few items as well as the relationships between them; they also express them by giving each item a 2-D position). The relationships in such chart-like diagrams are expressed as the connections between the items or the overlaps between the items. There are also so-called “graph-based” diagrams, which display a relationship between two variables that take either a continuous or a “discrete” ranges of values. The so-called “schematics” as well as other types of diagrams can be simply made with the help of ConceptDraw DIAGRAM software which is one of only a few similar applications allowing its users to have the pre-made templates and samples for having them as the drafts. There is one of the graph-based diagrams named an “onion model”. With the aid of this template you can describe an expanding as well as an extending relationship between the several concepts. The name of this diagram is “onion” for a reason of it similar looking to the layered shells, that become visible when you cut open an onion. The outer layers of such model add the size or complexity step by step to the central layers. The above named “onion diagram” can be introduced either as a “Euler diagram” or a stacked “Venn diagram”. For the record, a stacked “Venn” contains sets A1...Ak where each set An is a strict subset of An+1. In computing, this onion model is deployed figuratively due to the complex structure of information systems, which are split into layers for making it easier to understand them. A simple example is to start with the program, with an operating system and the hardware layers. Each of these layers can then be subdivided and so described separately. For depicting such “onion model” the Stakeholder Onion Diagrams are very popularly used, especially while working in the ConceptDraw DIAGRAM diagramming and vector drawing software extended with “Stakeholder Onion Diagrams Solution”. This solution can be found as well as downloaded from the “Management Area” of ConceptDraw Solution Park and from ConceptDraw STORE, which is another application developed by the specialists of CS Odessa. This solution offers the number of all the useful tools as well as “Stakeholder Onion Diagram” templates, so they can be used as drafts for your own great looking diagrams which are simple to create within only a couple of hours or even minutes. These templates are the most useful and convenient tool for fast and convenient drawing. You can create various diagrams as well as charts, including the “Stakeholder Onion Diagrams” having this solution. Stakeholder Onion Diagrams Solution offers a wide collection of different predesigned Onion Diagrams templates and samples as well as the stencil libraries. Each of the pre-designed Stakeholder Onion Diagram templates is carefully thought-out by the IT experts and it is available for viewing and editing from ConceptDraw STORE, which is an application that can be found and downloaded from this site. To get all of the expected excellent results for the successful creation of “Stakeholder Onion Diagrams” within only a few minutes, you can simply click on one of the desired templates in ConceptDraw STORE to open it in ConceptDraw DIAGRAM software. Afterwards, you can fill and change this template in accordance with your unique needs: you can both select and resize, you can move and remove any of the diagram's concentric circles, you can also add the needed text, the connections and the legend, you can change the colour and the general style of your drawing any time when you want to do that. ConceptDraw DIAGRAM application allows you to also create and to save your own custom template using the pre-designed vector objects from the stencil libraries offered by the “Stakeholder Onion Diagrams solution”. These diagrams can be “Onion Diagrams with Sectors”, “Stakeholder Icons” or “Stakeholder Onion Diagrams”. The templates and samples, which you can see on this site were all created in ConceptDraw DIAGRAM software and all of the source documents for working with this application are vector graphic ones and they are always available for reviewing, modifying or converting to a variety of formats, such as PDF file, MS PowerPoint, MS Visio, and many other graphic formats. The “Stakeholder Onion Diagrams Solution” is available for all ConceptDraw DIAGRAM users and it can be downloaded any time you need to use it for your professionally and simply smart looking drawings. For depicting the onion model are actively used Stakeholder Onion Diagrams. The ConceptDraw DIAGRAM diagramming and vector drawing software extended with Stakeholder Onion Diagrams Solution from the Management Area of ConceptDraw Solution Park offers the number of useful tools and Stakeholder Onion Diagram template for their easy design. Templates are the most useful and convenient tool for fast and easy drawing various diagrams and charts, including the Stakeholder Onion Diagrams. Stakeholder Onion Diagrams Solution offers in your disposal wide collection of different predesigned Onion Diagrams templates and samples. Each predesigned Stakeholder Onion Diagram template and sample is carefully thought-out by experts and is available for viewing and editing from ConceptDraw STORE. To get the excellent result for the creation Stakeholder Onion Diagram in a few minutes, simply click desired template in ConceptDraw STORE to open it in ConceptDraw DIAGRAM software. Now, you can fill and change template according to your needs, you can select, resize, move and remove diagram's concentric circles, add the text, connections and legend, change the color style. When your Stakeholder Onion Diagram or custom template is ready, you are able to export it to any of popular file formats - MS PowerPoint®, Adobe PDF, Microsoft Visio™, HTML, graphical formats by one click using the Export options from the File menu. All these wide ConceptDraw DIAGRAM abilities allows you easy make the presentations and reports, exchange with colleagues and publish your diagrams on web. The templates and samples you see on this page were created in ConceptDraw DIAGRAM software using the powerful tools of Stakeholder Onion Diagrams Solution for ConceptDraw DIAGRAM Solution Park. Use the Stakeholder Onion Diagrams Solution for ConceptDraw DIAGRAM to create your own Stakeholder Onion Diagrams and templates, Onion Diagram PowerPoint template quick, easy and effective. All source documents are vector graphic documents. They are available for reviewing, modifying, or converting to a variety of formats (PDF file, MS PowerPoint, MS Visio, and many other graphic formats) from the ConceptDraw STORE. 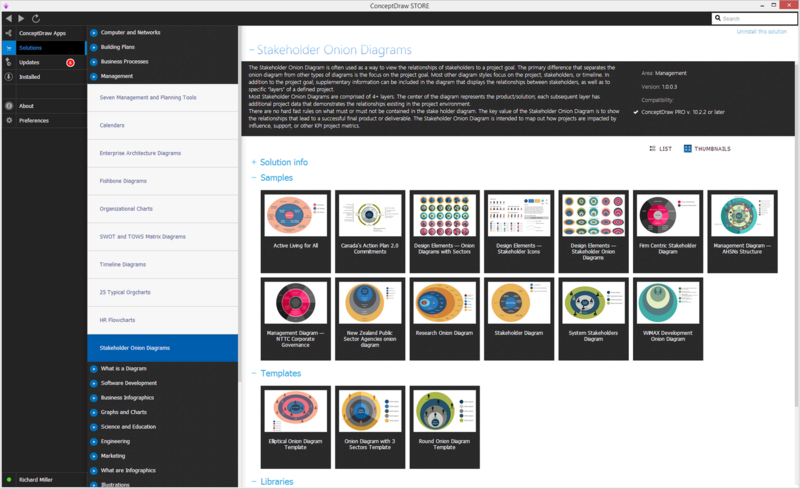 The Stakeholder Onion Diagrams Solution is available for all ConceptDraw DIAGRAM users. 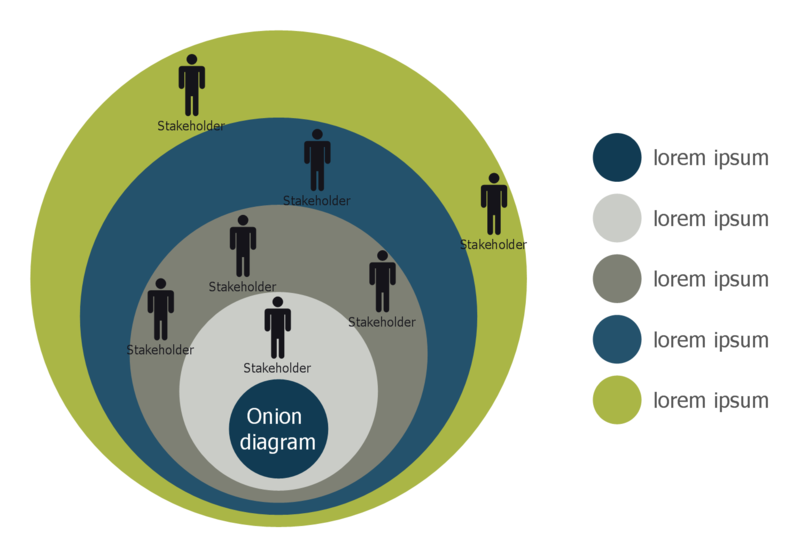 The Stakeholder Onion Diagram is a popular and widely used way to view the relationships of stakeholders to a project goal. The Onion Diagram focuses on the project goal, most of other diagram styles focus on the project, stakeholders, and timeline. This difference favorably distinguishes and separates the Onion Diagram from other types of diagrams. Design fast and easy Stakeholder Onion Diagrams of any complexity in ConceptDraw DIAGRAM v12 diagramming and vector drawing software using the powerful tools of Stakeholder Onion Diagrams Solution from the Management Area of ConceptDraw Solution Park. Onion diagram is a type of circular diagram that consists of the core circle representing the product/solution and concentric circles around it, which dependent on the core and look like the cross sections of onion. ConceptDraw DIAGRAM v12 diagramming and vector drawing software supplied with Stakeholder Onion Diagrams Solution from the Management Area of ConceptDraw Solution Park is an ideal software for effective Onion diagram process design. ConceptDraw PROJECT v9 is an effective tool for new and experienced users with a fine balance of usability and powerful functionality. This template shows the Context Diagram. It was created in ConceptDraw DIAGRAM v12 diagramming and vector drawing software using the Block Diagrams Solution from the “What is a Diagram” area of ConceptDraw Solution Park. The context diagram graphically identifies the system. external factors, and relations between them. It’s a high level view of the system. The context diagrams are widely used in software engineering and systems engineering for designing the systems that process the information.